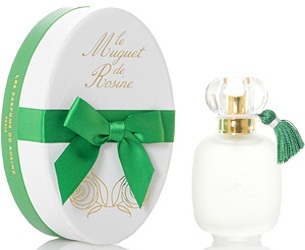 Last year Les Parfums de Rosine launched the limited edition fragrance Muguet de Rosine. Apparently it's very different from the earlier (now discontinued) Muguet de Rosine; this version is a composition of bergamot, pear, lily of the valley, rose, jasmine and white musk, developed for Les Parfums de Rosine by perfumer Nicolas Bonneville (who also created La Cologne de Rosine, which I enjoyed trying last year). Since Muguet de Rosine only arrived in the United States a few months ago, I've only recently had a chance to try it. It's a fruity floral that feels just right for warmer weather, but if you're looking for a lily of the valley soliflore, you'll be disappointed. The muguet note is there, in the heart, but it's overshadowed by the rest of the composition. Muguet de Rosine opens with lots of fruit, including the pear and a sweet-tart citrus note that reminds me of the bottle of LUSH Yuzu Cocoa shower gel I just finished off. The heart contains just as much rose and jasmine as muguet, but it's an upbeat, contemporary interpretation of a classical floral theme. The citrus lingers longer than I would have expected, and the flowers turn muskier as the base of Muguet de Rosine emerges. Muguet de Rosine has moderate sillage and staying power, and although I don't usually assign perfumes to specific occasions, it feels like a "weekend scent." It's not going to replace Rosine's La Rose de Rosine or Secrets de Rose in my affections, but it's cheerful and fun. If you love Rosine's Rose d'Eté or Annick Goutal Petite Cherie, you may also love Muguet de Rosine. If you were a fan of Chloe Collection (2005), with its pear-floral composition, you might enjoy this fragrance too. Muguet de Rosine has been a serendipitous discovery for me, and I'll be wearing it often this summer. Les Parfums de Rosine Muguet de Rosine is available as 50 ml Eau de Parfum ($135). For purchasing information, see the listing for Les Parfums de Rosine under Perfume Houses. I agree with you..real lily of the valley are so pretty and smells amazing, but there is no muguet perfumes, that really works with me. Not even Diorissimo, either. I love the vintage bottle of it, that’s why I keep it, but i just can’t wear it. I love looking at lily of the valley flowers — so delicate and whimsical! In perfume, though, it’s one of those floral notes that just aren’t “me.” I do own a teensy bottle of vintage Diorissimo, just to have — but I sniff it and never actually wear it! I love the vintages bottle of Dior perfumes. I miss them. I do like lily of the valley scents, starting years ago with Coty’s Muguet de Bois and moving up to Diorissimo. They may not smell like perfect replicas, but for me they evoke the garden bed of lily of the valley that I grew up with — against the the north wall of the house, shaded, cool and glorious. Now I use the occasional Yardley body product for that memory. Ah! Nice memory. Lilies of the valley do love those damp, shady spots! What a pretty box and bottle! The perfume does sound fun, but pear and I do not make a good pair, so shall skip this one. Shame though. The bottle is the usual Rosine prettiness (although my tassel is shedding, sad to say!) and the box is really lovely. It feels like a keepsake. In general, I have issues with perfumes based on flowers that exhibit a metallic, silvery edge… LOTV, hyacinth and even roses! But I love Secrets de rose, one of the very few rose fragrances I truly and shamelessly enjoy (another one is Mohur)…you are one of the few who mentions it (whenever you do, it makes me happy, because I think it deserves much more attention!!!) so I felt the need to comment and send you rose scented happy vibes!!! ???? I agree — Secrets de Rose deserves more attention! Not *every* Rosine, especially some of the more releases, is great — I think it was Glam Rose that really icked me out — but Secrets de Rose is a beauty of a Perfume.